Autumn Borts-Medlock is a renowned clay and bronze artist from Santa Clara Pueblo. Autumn hails from a long line of spectacular potters including Sister Tammy Garcia, Mother Linda Cain, Grandmother Mary Cain and Great-Grandmother Christina Naranjo. 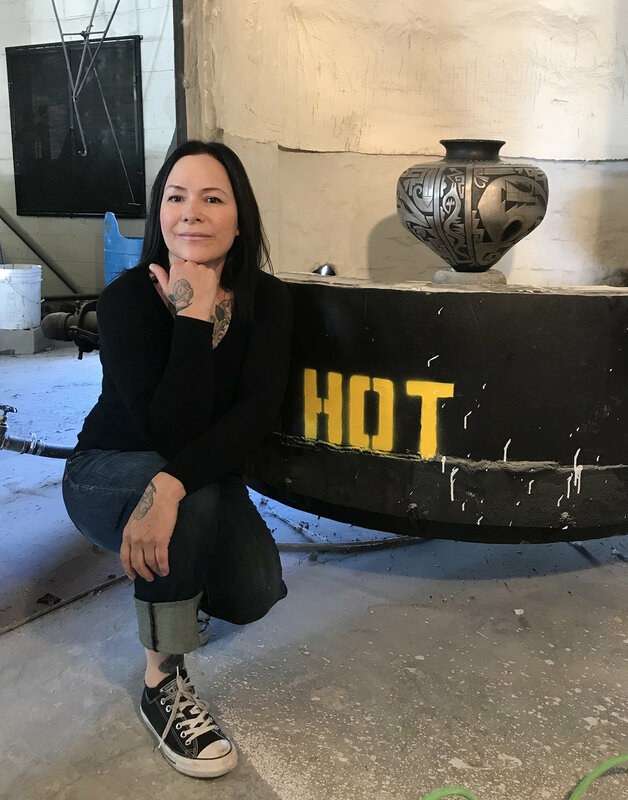 "Growing up in Santa Clara Pueblo, in a family whose connection to the clay goes back generations, pottery has always been a part of my life. I was introduced to the art form as a child, making my first formal attempts at claywork under the guidance of my mother and grandmother," explains Autumn. The artist draws from the spiritual symbolism and nature-oriented design aesthetics of Native culture. Autumn Borts-Medlock poses with mother Linda Cain and sister Tammy Garcia. Tintype by Will Wilson. Autumn's spectacular series of parrot-shaped forms have become a signature piece of her pottery and bronze work. The intricately designed parrot effigies are inspired by a fascination that was sparked as a young girl. Autumn reflects, "I was completely mesmerized by the beauty of the feathers adorning the regalia of the dancers at Santa Clara Pueblo. I used to wonder where we got these feathers because I’ve never seen a parrot in Santa Clara Pueblo." Intrigued, Autumn did some research and discovered that the birds were originally traded at Chaco Canyon by indigenous peoples from Mexico and South America. "These peoples would bring their parrots along the trade route to Chaco Canyon because they were just so extraordinary," says Autumn. Autumn shows a parrot during the coiling stage. The artist became enchanted with the history of Chaco Canyon and the exchange of goods that played a role in shaping Native cultures. To the people of Santa Clara Pueblo, the colorful parrot feathers came to represent the rainbow. "The rainbow is a sign of rain. Rain was such a central part of life then because it brought water to the people and to the crops. So that’s how the feathers came to represent prosperity and fertility. They were used in fertility ceremonies as well just because it’s all along the cycle of water brings life," explains Autumn. After forming a deep connection to the legacy of the birds, Autumn began creating her magnificent parrot effigies. Autumn explains the coiling process for creating her beautiful birds. Autumn first began sculpting parrots after her mother, Linda Cain, worked with the shape. "I just fell in love with the form after first working with it, so that’s why I continue to do them now," explains Autumn. Using traditional coiling techniques to create the shape of the bird, the artist then carves the designs on the birds free hand. Autumn begins drawing shapes onto the figure, deciding where she wants to put the eyes, the wings, and the intricate patterns that her parrots are known for. If she doesn't like a design at this stage, she can erase her work by wetting the clay and creating a fresh canvas. Once excited about the design, Autumn uses an exacto blade to cut around the perimeters of the pattern. Then she uses a variety of small screwdrivers and wood carving tools to carve everything, including the relief in the background. Autumn shows us a fully carved parrot and a parrot before the carving stage. After the carving stage, Autumn either takes her bronze parrots to be cast at the foundry or uses stones to polish her clay work. "Most potters from the northern pueblo, we use stones to polish our work. That’s what gets the shine on all this Native pottery you look at. It was painted and then burnished with the stone. It’s ridiculously time consuming. Now you can see how it could take a month to do the tiniest little piece," says Autumn. This is only a glimpse into the process of the parrots. A smaller piece, like the two shown above, take around three or four months to complete while a larger parrot can take anywhere from six months to a year to finish. The gentle and capable hands of Autumn Borts-Medlock produce works that reflect both her renowned lineage and strong connection to the parrots of Chaco Canyon. Below are some of Autumn's gorgeous birds that are on display at Gallery Chaco. Autumn incorporates Native patterns and captures the sacred spirit of parrots with her edgy t-shirt design. The Twelve Loves Exhibition hosted by Gallery Chaco turned out to be the greatest show yet! Featuring many fantastic artists, the show explored different facets of love through visual interpretations. Each artist created work relating to their views and understanding of what love is. The artists included Autumn Borts-Medlock, Althea Cajero, Joe Cajero, Tammy Garcia, Ira Lujan, Rhett Lynch, Patricia Michaels, Mateo Romero, Penny Singer, and Adrian Wall. Love was felt throughout the night as the artists, their families, close friends, and art enthusiasts alike came together. Adrian Wall and his family proudly posing in front of his work. Adrian Wall, a well-known sculptor and jeweler from Jemez Pueblo, poses with his love Shondinii and their three beautiful daughters Maria, Kiowa and Skye. The sensational limestone sculpture in this photo titled "Awake And Dreaming" truly showcases Adrian's talent working in stone. The eagle feather hanging above is carefully crafted out of glass. Combining his talent in glass and jewelry, Adrian also creates original earrings that are prominently known. Adrian Wall's many talents brings a unique variety of work to Gallery Chaco. Ira Lujan and his mom Jan look at each other lovingly. Ira Lujan of Taos/Onkay Owingeh Pueblo is a talented glassblower who puts a contemporary spin on Native themes. Creating works from glass antlers to astoundingly crafted canteens, every piece is fashioned with impeccable attention to detail. Along with many family members, Ira's mother was present at the show. The pride was evident on Jan's face, as she celebrated her birthday at her son's show. The family celebrated at Hotel Chaco following the exhibition. Designer Penny Singer and artist Tammy Garcia. Penny Singer and Tammy Garcia catch up at the show. Penny's garments are created with the Native American Spirit in mind. Some of her most recent work includes a fun line of bow ties that have a contemporary, fun flare that will brighten up any outfit. Tammy has recently started an exciting new chapter in her career by beginning to paint. Already a master of bronze and clay, this new medium provides new opportunities and a fresh creative space. Penny Singer and Tammy Garcia are just two of Gallery Chaco's artists who have been friends for years. The nurturing friendships between so many of the artists is just one of the many types of love felt at the show. Mateo Romero and wife Melissa pose affectionately. Mateo Romero is a contemporary Pueblo painter and award-winning artist. Some distinctive themes of his paintings include landscapes and ceremony regalia. Mateo's wife, Melissa, has been his biggest supporter. The couple live in Pojoaque with their three beautiful children and continue to be active voices for Native Peoples. For the Twelve Loves Exhibition Mateo created the "Heartwork Series" of oil and clay heart paintings on canvas. Althea Cajero explains the process of cuttefish bone casting. Althea Cajero of Santo Domingo and Acoma Pueblos creates her stunning jewelry with cuttlefish bone casting, which creates the distinctive design that she is known for. Althea became a jeweler after meeting her husband, talented artist Joe Cajero. The two are a wonderful couple who support each other's art endeavors with love. In the above photo, Althea explains her process for creating jewelry. This exhibition was a wonderful opportunity for artists to share their processes and people to learn more about the world of art. Gallery Chaco aims to put on art shows that make everyone feel welcome and encourage learning and growth about not only art, but Native cultures. The Twelve Loves Exhibition was a night full of laughter, friendship, learning, and love. Thank you to everyone who came and made the event such a success. We hope to see you at the next show! Below are more pictures from the show. Patricia Michaels showcasing her beautiful hand crafted designs. Artist Autumn Borts-Medlock stands with her mother Linda Cain. Artist Joe Cajero speaks with attendants of the show. Patricia Michaels is a Native fashion designer from Taos, New Mexico who is know for elegantly capturing the beauty of Native culture in her pieces. Pushing Native American designs in a new direction, she successfully combats stereotypes and creates fresh, contemporary pieces that invite the world to get a true sense of the modern-day Native. Patricia was the first Native American designer to compete on Project Runway in 2012. Bringing an understanding of Native American design and culture to the Emmy Nominated television show, Patricia earned the title of first runner up in season 11. From the New York City runway to prestigious museums, Patricia Michaels has represented her heritage with grace. As one way of incorporating Native culture throughout the entirety of the experience, Hotel Chaco commissioned Patricia Michaels to design the signature uniforms for the staff. The chic uniform designs capture the essence of Patricia's purpose and vision as a Native designer. The valet shirts and guest services dresses feature a maze pattern that boldly encompasses the entirety of the garments. The maze design represents the journey that every person takes through life. There is no entrance or exit to the maze, but an end in the middle because it is at the center of ones being that the individual will find themselves. The black and white cocktail skirts wield a pattern inspired by the designs found at Chaco Canyon. The simpler uniforms were designed to be sleek and elegant. All of the Hotel Chaco designs created by Patricia Michaels communicate Native themes to out of town guests and New Mexico locals alike. Hotel Chaco General Manager LIz Robinson and Patricia Michaels wearing Patricia's designs. Gallery Chaco features the original works of Patricia Michaels. While Patricia does have some fabricated designs produced in larger quantities, one of her signature qualities as a designer is her use of natural materials. An important trademark of her designs is the rare textile techniques she uses. All of the fabrics created in her studio are either hand painted, dyed, printed or embellished. Since the materials are all hand manipulated in some form, the result is garments that are each unique and original. Patricia creates in her Taos, New Mexico studio and home. Hailing from Taos Pueblo, the designer finds comfort and inspiration in the beauty of her Native land. Every space in her studio functions as some part of the design process. From the reference books that line her shelves to the table of beads under her bedroom window, Patricia utilizes her entire home as a studio. The cherished elements of her Native life, including ceremonial blankets and traditional woven baskets, are found throughout her home and aid her in retaining Native culture in each handmade garment. Patricia knew she wanted to be a designer from a young age, creating her first garment in the second grade. As a young girl she would admire the beautiful models and designs in fashion magazines. It was her grandfather who taught her that the most beautiful part of life is the beauty in nature. Patricia is consistently inspired by elements of nature and incorporates these into many of her designs. Some reoccurring themes include eagle feathers, cloud patterns, and rain. Whether inspired by nature, Taos Pueblo ceremonies, or pottery patterns, each garment tells an important story. Patricia Michaels is an innovative artist who has revolutionized Native design.